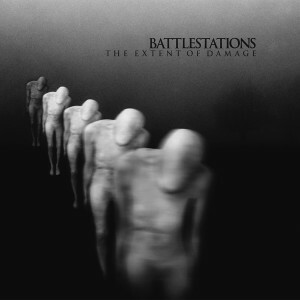 We’re excited to bring you the first taste of the sublime new Battlestations album The Extent of Damage. The music video for the epic 12 minute instrumental ‘Necro’ is available for streaming on YouTube. Like a high-definition camera roving across a ruined world, The Extent of Damage is both unflinchingly bleak and stirringly beautiful. Akin to Ennio Morricone at his most dark and doleful, and Portishead’s majestic self-titled second record, this music’s atmosphere of urban oppression is leavened with passages of sublime, redemptive beauty. Battlestations interweave the subtle with the dramatic, the intimate with the cinematic, the introverted with the bombastic. Across their eclectic and atmospheric instrumental rock, industrial ambience is counterbalanced by beautiful piano melodies, eerie samples and lyrical guitar lines. The result is incredibly evocative music, complex in both its narratives and textural composition. The Extent of Damage sees official release on the 8th of October and is available now for pre-order.